The Urban Dictionary defines the phrase “Better Ask Somebody” as an evasive response to a question that should be known, letting the questioner know that he/she is out of the loop. In the case of Boston’s ever changing rap scene, there are few rap acts you can apply that phrase to. In the case of Ripshop & Reel Drama, if you’re curious, You Better Ask Somebody! Since 2004, Emcee Ripshop and DJ/Producer Reel Drama have been exemplary bastions of Boston bred boom bap culture, pumping out music that quells any uncertainty that Boston heads are capable of delivering Hip Hop-centric music on the same caliber as any prolific MC/DJ duo ever did, e.g. Gang Starr. Both hailing from Boston’s Dorchester neighborhood, these two cohorts have proven themselves to hold ranks amongst Boston’s rap elite. Their collective resume’s speak volumes. A journey that comprises entities like Rawkus Records and DJ Premier, and stints on Clear Channel Radio and headlining concerts in front of thousands in Downtown Boston. Ripshop and Reel Drama effortlessly exude a hip hop authenticity modern day rappers piping through the sound system of your favorite sneaker boutique only wish they could pull off. 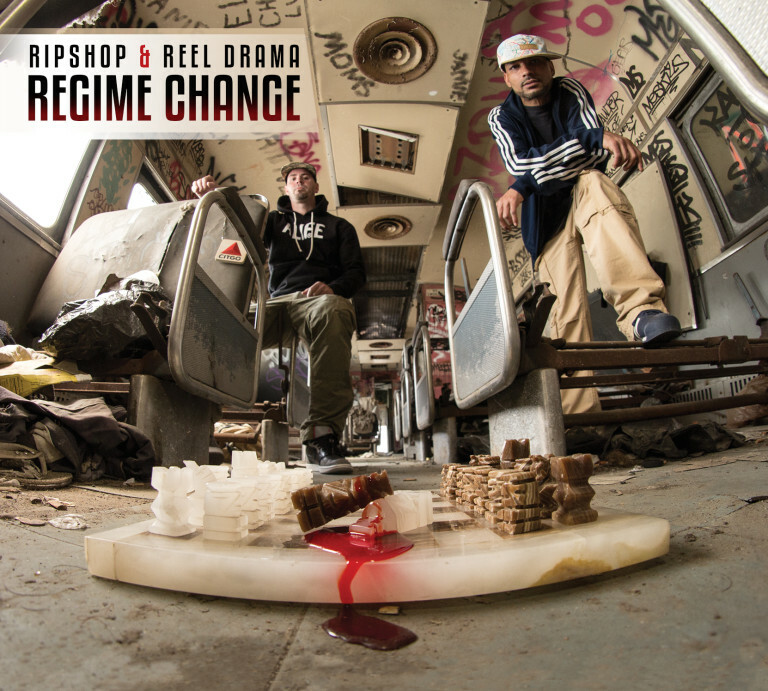 With two classic critically acclaimed full-length albums under their belt, (Playtime’s Over and The Authenticity) Ripshop & Reel Drama reemerge in 2016 with their latest offering, “Regime Change”. In this age of cliche’ rhyme patterns and auto-tune heavy formulaic production, these two surely have to tweak some things to stay relevant. Anyone whose privy to these respected Beantown veterans knows what to expect: Dirty beats, rhymes, and life, served on a silver vinyl platter, Dorchester style. Regime Change delivers 16 tracks of authoritative boom bap that your O.G. uncle from the Bronx would approve of. Regime Change appearances include Edo G, Big Shug (Gang Starr Foundation), Akrobatik, Reks, Tragedy Khadafi, Rockness Monsta (Heltah Skeltah), Moe Pope, JTronius, NoDoz (Golden Brown Sound), Kodac (M80), and Zakiyyah, Ripshop’s sister, who loans her unique voice to a song dealing with the ordeal of their father’s double lung transplant operation. Unique life stories and scenarios masterfully orated to the backdrop of world class underground hip hop beats. A Regime Change indeed. Regime Change isn’t the typical pseudo-rap album chock full o’ joints that feature an emcee rappin’ about rappin’. Rather, it plays out as the perfect storm of two industry seasoned masters of their own crafts taking a huge puff of a blunt called life, and exhaling a flawless cloud of music all up in your face. No pleasantries here, folks, this is a Regime Change. The album is rift with irreverent topics, covering the gamut from a song about the perfect woman who doesn’t exist, to landing in the position of being assigned as the Power Of Attorney for a father looking death in the eye while juggling life’s every day issues. If you are one of the countless jaded Hip Hop heads that has given up on the notion that North East Hip Hop sensibilities don’t exist any more, rest assured, there is still hope.